Last week I shared with you a different version of some Star Wars Valentine’s. Of course, I can’t leave good enough alone and came up with a couple different versions…just in case you like one better than the other! *As always, my printables are provided for your personal use only. Please do not redistribute or share on your sites or in your stores. Thank you! I simply printed them onto some white computer paper. Then cut them out and wrap them around your Hershey’s Nuggets. I glue them together with a simple Elmer’s Glue Stick. I also created a bag topper if you want to group a set of them together in a cellophane baggie. The baggies I used measured about 4 by 6 inches. 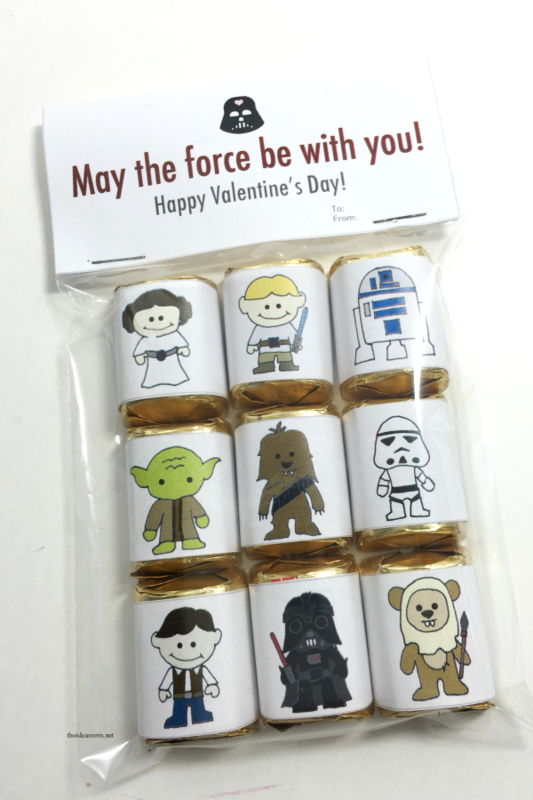 I just layered the chocolate in rows of three so that all nine different Star Wars Characters are in the bag. Cut out the bag topper, fold it on the line provided and then staple it onto the top of the cellophane baggie. Looking for other star wars ideas? 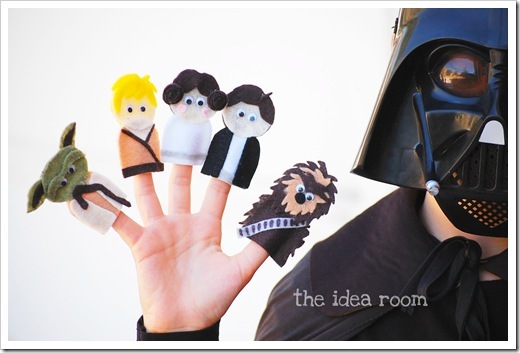 Check out our Star Wars Finger Puppet Patterns! If you liked this post, I would love for you to pin it. Thank you! Looking for more Star Wars Ideas? 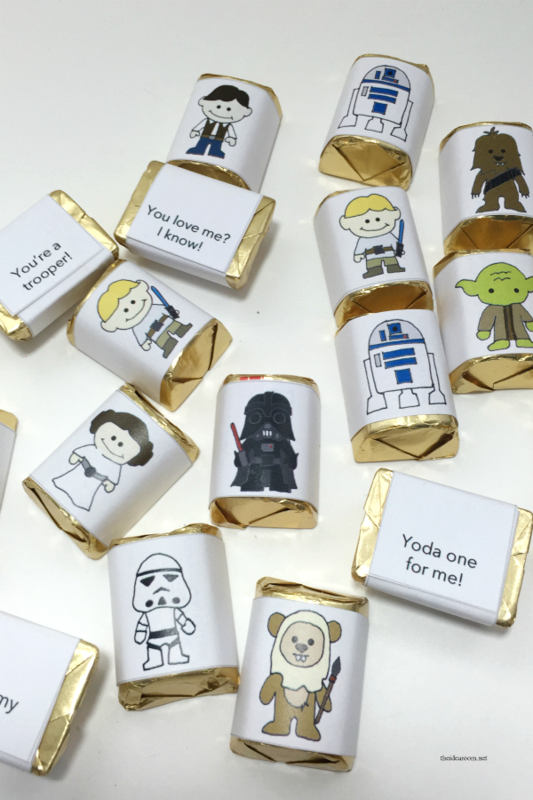 Check these 23 Star Wars Party Ideas out. Thank you so much for the cute Hershey candy wrapper downloads. BTW… I loved the tic tac SW covers and so did my grandson. You are welcome! Thanks so much for the comment. I am glad to hear you both loved them! Thank you for these adorable printables. I can’t wait to send the treats to school with my daughter, Amy! When I printed the nugget wrappers, the Chewy was cut in half. Is there a way I can adjust? Thanks for the free printables. They are so cute! I just wanted to thank you for answering a moms prayer. I am trying my hardest to put together a birthday package (his first package since he left on his mission December 30) he loves Star Wars. When opened his call in Nivember but he wasn’t leaving until the 30th I was so glad I would finally have all my kids home for s Christmas. But he said “I thought I would leave before Star Wars now I will get to see it!” We all thought that was so funny. So for his birthday I thought I would look for Star Wars plates cups decorations etc. so I could send him a birthday party. But I didn’t know what to do about treats and his birthday is next week, so I need to have it in the mail today. Then of course the next 3 days were a whirlwind with last minute things to get. Packing etc. but Wednesday was the best day since we did have some experience with that. Third kid in a row. So we arrived in Provo about 11 ( the perfect time since Chuck a Rama opens at 11) they feed the in going missionary free.,which was so great because my RM that went to Chile finished his mission 8/14 is 6’4 and can eat more than you think as thin as he is. My hubby is tallest at 6’6 and can eat more than all of them. My daughter (other RM) is only about 5’6 and I am 5’4 (but we all enjoyed that nice lunch, and not feeling so rushed like we were dropping off the other 2. So we were able to go to the temple and take pictures like we had wanted too with the others but we never had the time. Then we got to the MTC for the drop off and it was the best of all 3 of them. The sweet missionary that was escorting Conner even stopped and said “would you like a family picture on the curb?” Of course we did but we were so surprised that happened because usually it’s really a 5 minute drop off. So that touched me a lot. Then he hugged everyone (saved me for last) he had whispered that in my ear when we first got out of the car and he was standing next to me. So I knew I would be last. I was ok with that. But watching him hug his sister who had just come home and now he wouldn’t see for 2 more years was hard, but also very touching as I heard what she whispered to him when she hugged him. Then when he finished with his brother and his dad and it was my turn I just wrapped my arms around my 6′ tall son (shortest son I have) I did my best not to cry. But told him how much I loved him and if he ever needed anything while he was gone just to let me know and I would get it for him. A few other personal things. Plus the things he whispered to me. Then he let go and grabbed the biggest suitcase and he walked away. Never looked back again. I know him and how tender hearted he is. I know he was crying but he didn’t want me to see him. So I am sorry this is so long. I actually started typing it about an hour and a half ago. But I just wanted you to understand how crazy, but wonderful and hard the last couple of months had been before he left. So of course my MS symptoms that were already occurring in October, just continued to get worse until I am literally the worst I have been before treatments since I was first diagnosed almost 19 years ago. So I really wanted to do this package but I knew I couldn’t write the words May the FORCE be with you! Honestly I struggle with the computer always, even when my MS isn’t flaring. So I went to the Missionary Moms group and pleaded for help last night about midnight. Just asking if there is a place I could go on the computer where I could just print the words. Also I asked them to please make it easy for me since I have a hard time figuring things out when my MS isn’t flaring this much. So imagine how bad it will be now. So I finally had to take my medications. Lay down and try to rest and hopefully sleep. So when I finally turned to Facebook today as I sat in the hospital waiting for results. This is the link that was on my post. I went to it and started to cry. Thank you so much. 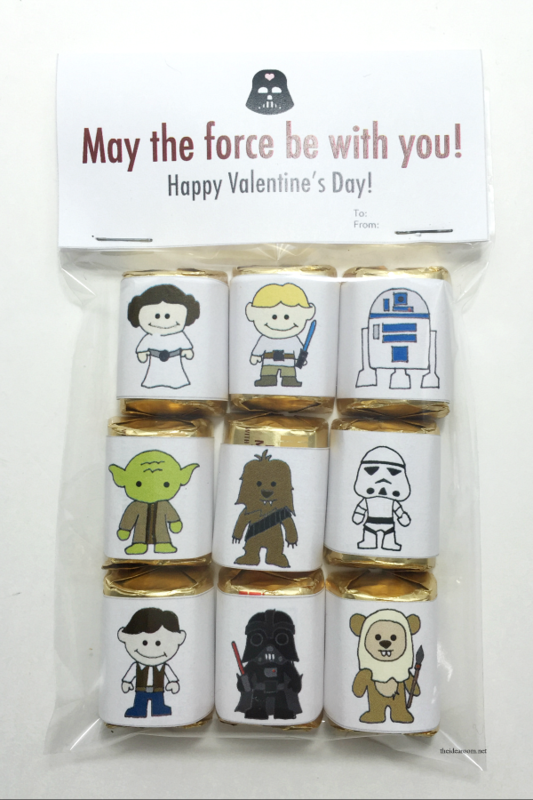 I realize these Star Wars ideas Tic Tacs and Hershey’s nuggets are for Valentines but I am sure I can just print them and cut the bottom line off. Thanks so very much for sharing this especially for me. You literally answered a weeping moms prayers last night. Thank you for sharing your talent. Thank you so much for all of this. I would hug you if I could but I am sending love and virtual HUGS and tons of gratitude today! Thanks again! What a tender experience. I too will be sending a missionary off soon. So glad that you found these printable’s helpful. Hope your son enjoys them! Hope he enjoys them! Thank you! These are awesome. Thanks so much! All of my kids ages 6-15 chose these for their valentines! That is so fun and make it easy. Glad you enjoyed them! Super cute printable. What size of tic tacs should be used? 1 oz or 3 oz? Thanks for sharing, these are excellent! These are the cutest thing ever! Thanks so much for sharing. 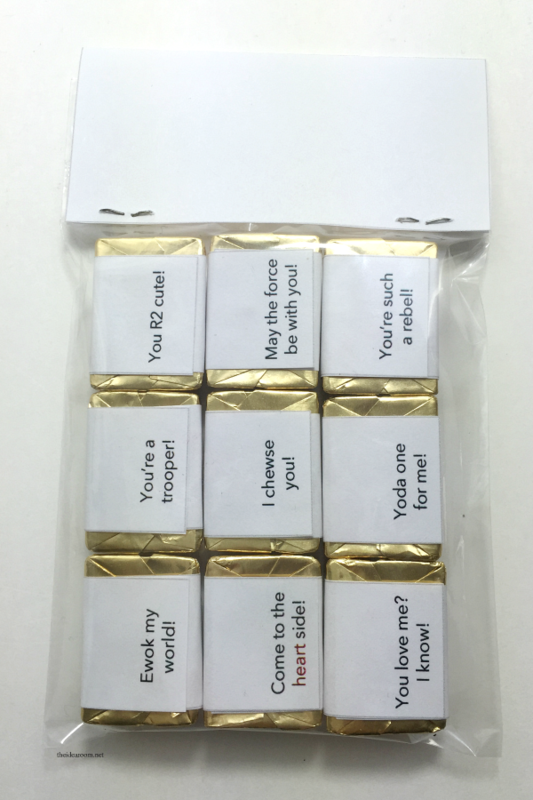 These are so clever! We have an old SW fan (me) and two new ones (my daughters) in our house. We’re putting these together today for their classmates. I can’t think of a better way to spend an evening. Thank you! So glad you are finding them useful! Thanks. I love this! I did this for my son just last night. Such a brilliant idea. Thanks so much for the printable! 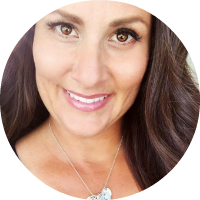 I just joined your email list too–this was so helpful for a busy mom! So glad you like it. Thanks for signing up for my emails! Thank you. What a cute idea for May the 4th! 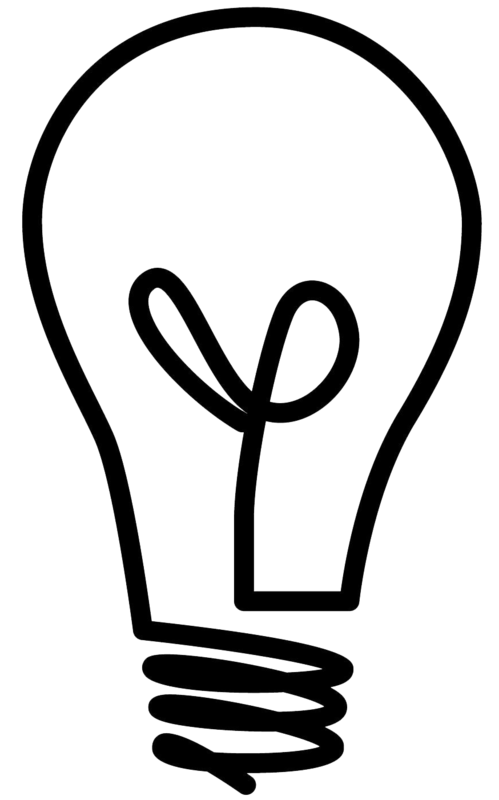 I just love your site and I am forever pinning your ideas to save for future gifts/crafts/recipes. I love to give homemade gifts, so I appreciate your free downloads, etc… Thanks again! Margie, thank you so much! Love these for my little star wars fan. Thanjs for sharing. She is excited about making/handing then out this February. These are wonderful! Thank you so much for sharing!! We are a Star Wars loving family and I can’t wait to send these to my sons who have grown up and moved away! Thanks again!!! Fantastic! So making these for my husband 😍 Thanks! How fun! You are such a nice wife! 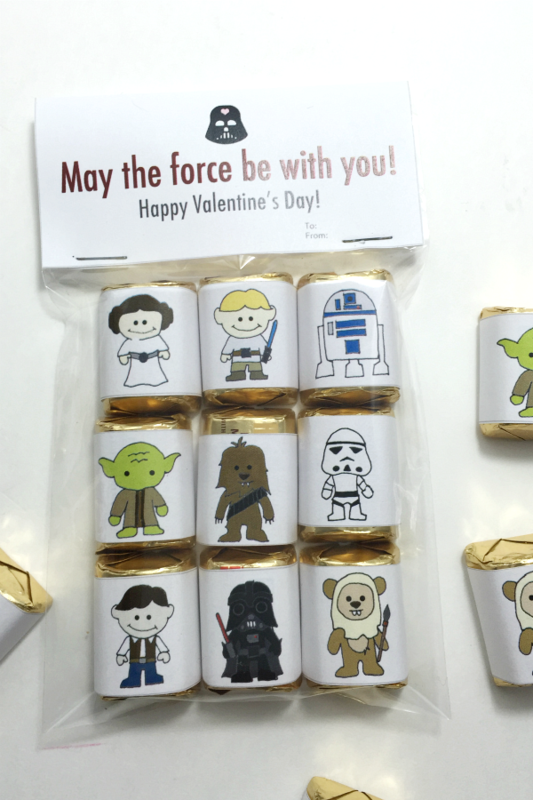 Can you make the star wars valentine printables to size for the mini hershey bars? I love the designs and would love to make them for the small bars not the nuggets. I saw the tic tac ones too and i am going to make those for the adults! Marilou- You may be able to adjust the size in a word document. Thanks so much and enjoy! Is there any way to get the word version? 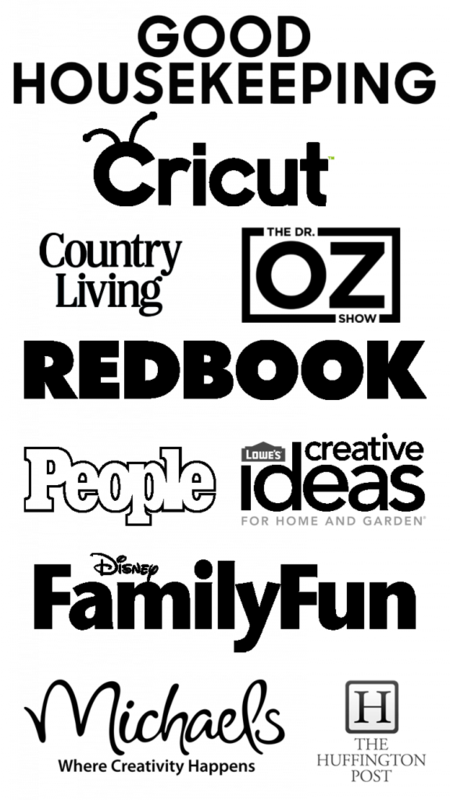 I am hoping to make these for our vacation and would love to print them on address labels for speed? Thank you for your consideration! 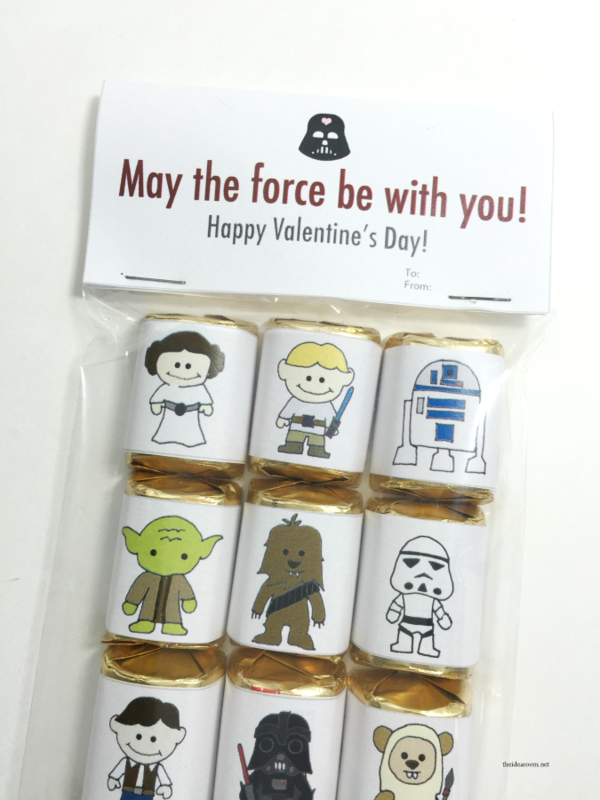 Thanks for the adorable star wars printables!! Thank you for sharing your graphics! My son punched out the characters with a circle hole punch to make glass magnets. We then made cards in Publisher using the cute sayings. Monica-So glad you liked them! My nieces and nephews will love love love these! Thanks for sharing for free. Kim- So happy that you like them. I hope that your nieces and nephews do too! My son loved these. Thanks! Kathleen- Yay, so glad he loved them!